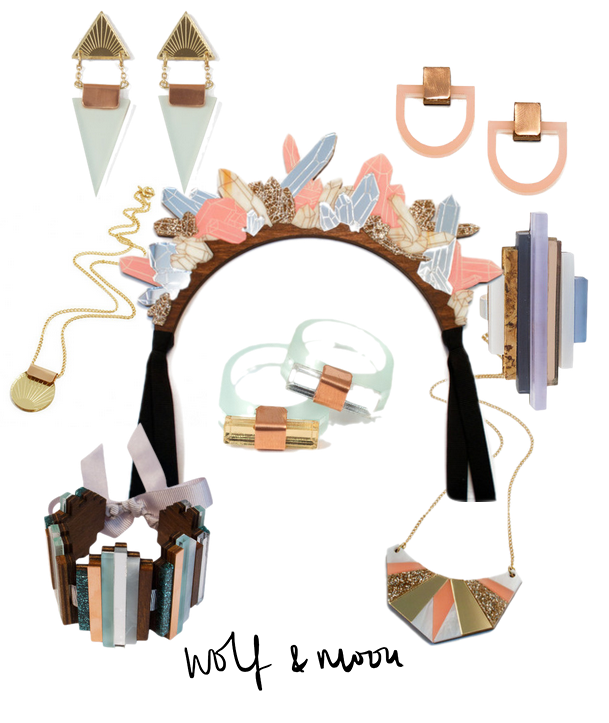 I have completely lost my mind over British designer Hannah Davis' handmade jewelry at Wolf and Moon. So much so it took me 4 days to actually pull an order together for my recent birthday as there was just too many spectacular pieces to choose from. Graduating from the prestigious Goldsmith college with a degree in fine art, Hannah started selling her pieces on a market stall and since then has expanded to stock her online shop and provide pieces to boutiques in the UK and Europe. Taking inspiration from a variety of places, Hannah utilises absolutely stunning shapes and colour combinations in a variety of materials which she then gives you the ability to customise by offering most pieces in a variety of combinations. This option to tailor your choices is what really stood out for me when shopping on the Wolf and Moon site as it gave me the ability to pick my favorite items in a combination that then works with particular outfits or works in tandem with jewelry I already own. Her latest collection, Fjordland, just launched online and it inspired by a journey through the impressive fjords of Norway and includes some phenomenal shapes. A stunning look book has been put together to showcase the collection and I absolutely adore what they have done with it. Pops of colour and simple, clean but still sharp lines really let the products speak for themselves. They all have such a lux, high end look considering the fantastic prices. I love that in this collection the team have added in the option for a sterling silver base for many things and it certainly made my deciding even harder. For my birthday I ended up splurging hard. It started off innocent enough- a little harmless ring in the sale stole my heart... and from there all hell broke loose and I decided to get a few of my most favourite pieces they had on offer. I was delighted with the fast delivery service and the way the whole lot was packaged up was gorgeous, you know when even the bubble envelope is pretty that you are on to a winner. The expensive feel carries right through into their branding, the little boxes and bags are really pretty and just make the purchase feel really special. But of course I still have a ridiculous wish list that I just had to share with you guys as I think there are some incredible bits on here that are perfect for summer. Aren't they all just stunning? I don't think I could ever tire of glitter and perspex! I am already plotting purchase number 2... what would you go for? Such beautiful pieces - thanks for introducing me to this brand Ruth! It looks slightly contemporary which isn't my usual style but there's still enough of a 'pop' that a few pieces are catching my eye!